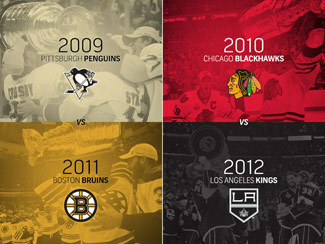 The final four of the Stanley Cup Playoffs is truly a tournament of champions. For the second time in the history of the League, the final four teams standing in the playoffs are the past four champions. 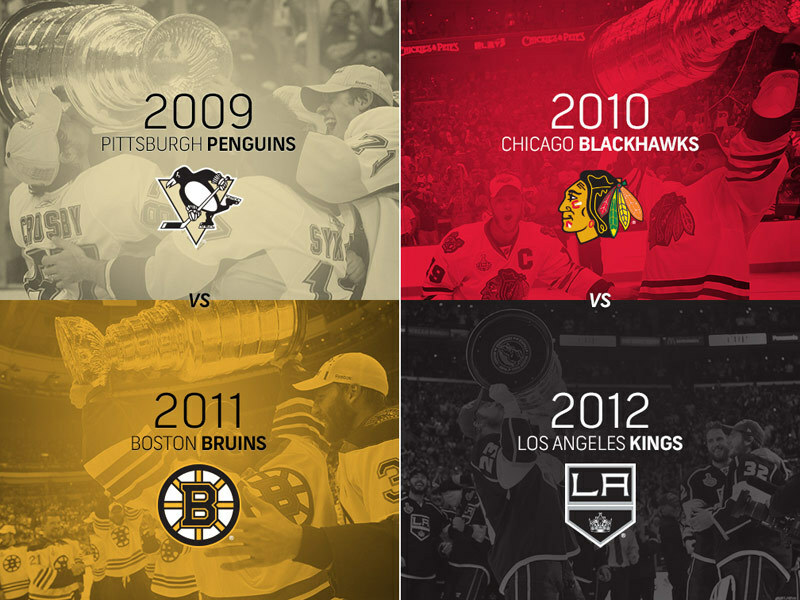 The Los Angeles Kings (2012), Boston Bruins (2011), Chicago Blackhawks (2010) and Pittsburgh Penguins (2009) are the remaining teams in 2013. The fifth-seeded Kings will play the top-seeded Blackhawks in the Western Conference Final. Coincidentally, the Blackhawks booked their passage to the conference final with a Game 7 overtime victory Wednesday against the Detroit Red Wings, who won the Stanley Cup in 2008. Brent Seabrook scored the series-clinching goal for Chicago, who rallied from 3-1 down in the best-of-7 series. In fact, both Western finalists needed all seven games to subdue their second-round foes. The Western Conference Final opens Saturday at United Center in Chicago (5 p.m. ET, NBCSN, TSN, RDS). Later that evening, the East's top seed, the Penguins, host the fourth-seeded Bruins in Game 1 of the Eastern Conference Final (8 p.m. ET, NBC, CBC, RDS) at Consol Energy Center. Both Eastern finalists took five games in the second round to advance. Each will have had at least a week off between games by the time the Eastern Conference Final begins. The Penguins and fourth-seeded Bruins played three one-goal games during the season with Pittsburgh emerging victorious each time. It is a series rife with storylines. In the Penguins' first two championship runs in 1991 and 1992, they met the Bruins at this stage of the playoffs each time. This season, the Penguins feature forward Jarome Iginla, who landed in Pittsburgh in controversial fashion around the NHL Trade Deadline. The Bruins believed they had consummated a deal to land to Iginla, only to find out the Calgary Flames had made a separate deal with the Penguins that was binding. The Bruins feature veteran forward Jaromir Jagr, who was a member of the Penguins during their back-to-back title runs two decades ago. Jagr, who started the season with the Dallas Stars, was traded to Boston after the Bruins were spurned by Iginla. Jagr, by the way, sits at No. 2 for almost every offensive category in Pittsburgh franchise history, sitting right behind the iconic Mario Lemieux, who now owns the Penguins. This is the second-straight season Jagr returns to the Steel City as an opponent looking to end his former team's Cup dreams. In 2012, Jagr was a member of the Philadelphia Flyers team that upset the Penguins in a wild first-round series. The rosters of the four conference finalists (those with a minimum of one game played in the 2013 playoffs) boast a total of 56 players who have their name engraved on the Stanley Cup (Kings 19, Bruins 18, Penguins 11, Blackhawks 8). The other time the champions from the previous four seasons played on the final-four stage was 1945. That season, the Montreal Canadiens (1944 champions) played the Toronto Maple Leafs (1942), and the Red Wings (1943) played the Bruins (1941). Toronto and Detroit advanced to the Cup Final, with Toronto winning 2-1 in Game 7.